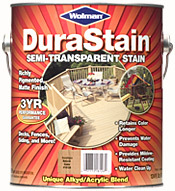 Wolman™ DuraStain Semi-Transparent Stain protects new and older decking/wood from UV radiation, mold growth, and rotting. Beautifies wood with a richly pigmented, semi-transparent, matte finish while providing durability and prolonged color retention. Retains color longer than traditional semi-transparent stains. Ideal for wood exposed to the severe sun. – When applied the Wolman™ DuraStain looks very unnatural. The stain sits on top of the wood similar to a paint or solid deck stain. It actually looks like paint with just a small amount of transparency. The Natural Redwood color that used masked the wood grain instead of enhancing the wood grain. – Wolman™ DuraStain does an excellent job of preventing graying. We attribute this to the overall appearance of the stain. This product looks very close to a solid color stain. Lots of pigment means excellent UV protection. There was little to no graying of the stain that was still left on the deck. The areas that peeled (see below) had turned gray since the wood was bare. – We were not impressed with the Wolman™ DuraStain when it came to preventing peeling at the two-year mark. When a stain does not penetrate into the wood but rather “films” on top of the wood then the chance for peeling is greatly enhanced. The Wolman had peeled on 30% of the flooring.